As children, it is hard to think of your parents as anything but caretakers. Even when you become an adult and move out, it is hard to think of your parent as an equal. For many children, it is a jarring experience when their parents are no longer able to take care of themselves without assistance. Many parents have a hard time admitting when they need help, especially from their children. Deciding whether your parents move in with you is an important decision since it has major consequences for both you and your parents. For most children, the first instinct is to accept their parents into their home without question. While this is a nice gesture, you may ultimately do more harm than good. You need to have an honest conversation to decide whether you are in a position to accept your parents. In some cases, there may be financial concerns. Other times, it has to do with where you physically reside, as some locations are detrimental to aging adults who need assistance. Ultimately, every family has different needs and expectations, but there are some general tips you can follow to help decide whether your parents can move in with you or if you need to seek out alternate housing. How will the move effect everyone in the house? Will your parents moving in change family routine, activities or privacy? 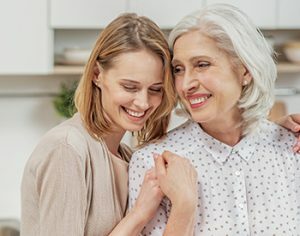 Is everyone in the household comfortable with your parents? Do you physically have the space for your parents or do you need to remodel your home? If your parents have health concerns, then is your home a safe place for them? Do you expect anyone else in the household to pitch in with taking care of your parents, or do you intend to be their primary caretaker? If you are the primary caretaker, then do you plan on changing your work schedule to accommodate your parents? Are your parents able to contribute financially? If not, then can you reasonably afford to provide for your household and your parents? Do your parents have any pets they intend to bring with them? Are your parents comfortable with the rules and boundaries you set for them? All of these questions are designed to show whether you and your household are ready for your parents to move in or to address potential situations you might have overlooked. In some cases, simply adding some home automation products for senior living can make the transition easier. It is okay if you do not initially have answers for some of these questions. It does not mean your parents cannot move in, but it does indicate you need to take a second look at your living situation. For many children, the hardest question to answer is whether they are ready or able to take on the role of primary caregiver. Children feel pressured to immediately say yes to repay all the years their parents cared for them. However, if you are genuinely in a position where you cannot afford to care for your parent or you believe your home is not a safe environment, then you are doing both yourself and your parent more harm than good by agreeing to the arrangement. Once you assess whether you and your household are comfortable with the idea of moving your parents in, you need to ask your parents the same set of questions and raise any additional concerns posed by other members of your household. One additional question to ask your parents is if their move takes them away from friends or activities they enjoy in their community. This is an important question to consider, especially if your parents have lived in the community for many years. Depending on the condition of your parents, it may be hard for them to meet new people if they move to a new community. If your parents cannot leave the house without your assistance, then they are only able to meet new people when you are there to bring them to events. Depending on your work and home schedule, this may make socializing challenging. Senior apartments may be an option for your parents depending on their health and abilities. One mistake both children and parents often make is neglecting to speak with a health professional. Many parents have a difficult time admitting when they are vulnerable to their children, leading to them downplaying how serious their condition is. If you are planning to move them away from their living situation, then you and your parents should speak with to parent’s current physician. Their physician is capable of giving you unbiased answers regarding what is expected of you as a caregiver for your parents. One of the most important questions you need to ask is how independent your parents truly are. Your parents may insist they are able to leave the house without you, but their physician may have other ideas. Similarly, your parents may insist they can help out around the house, but not be in a condition where they can offer much assistance. You must also speak with their physician about who your parents need to see after moving. If your parents currently see a medical specialist, then you need to find out if any of those specialists are available in your area. If your parent requires frequent trips to the doctor, then you need to decide if you are capable of taking them. When discussing your parent’s health, it is important to consider their current health and what changes can occur in the future. For example, if your parent is likely to lose mobility in the next few years and you did not factor this into your initial questioning, then you need to go over the questions again.